I’ll pounce on some pens in a millisecond, while others I’ll mull over for months. It’s not really a price thing (within comfortable limits), it’s more of a “what does this pen bring to the table?” type of pondering. I’ve looked at the Lamy Studio many, many times, but never felt won over enough to make a purchase. I can’t quite put my finger on why I’ve hesitated for so long, but some of it has to do with the polished chrome grip section that you see on most models. It looks like a fingerprint magnet and potentially slippery, and this, I think, is what’s been holding me back. 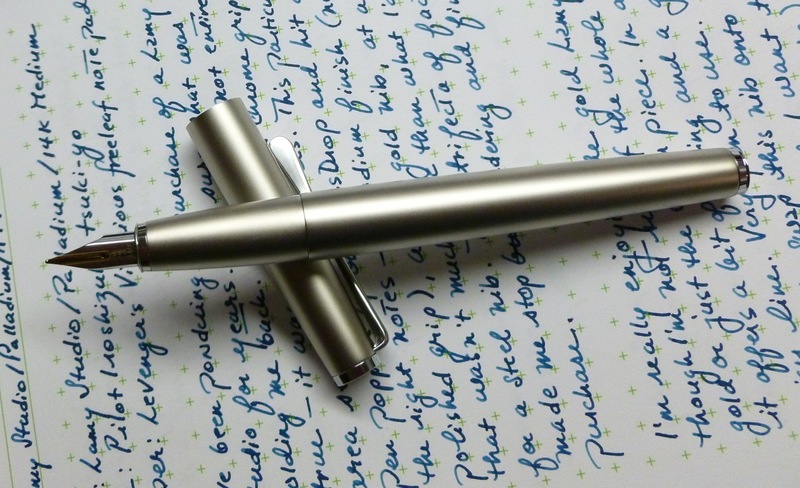 A Lamy Studio recently popped up on MassDrop and happened to hit all the right notes— a Palladium finish (so there’s no highly polished grip), a 14k gold nib, and a price that wasn’t much higher than what I’d pay for a steel nib. That trifecta of factors pushed me from pondering to purchasing. 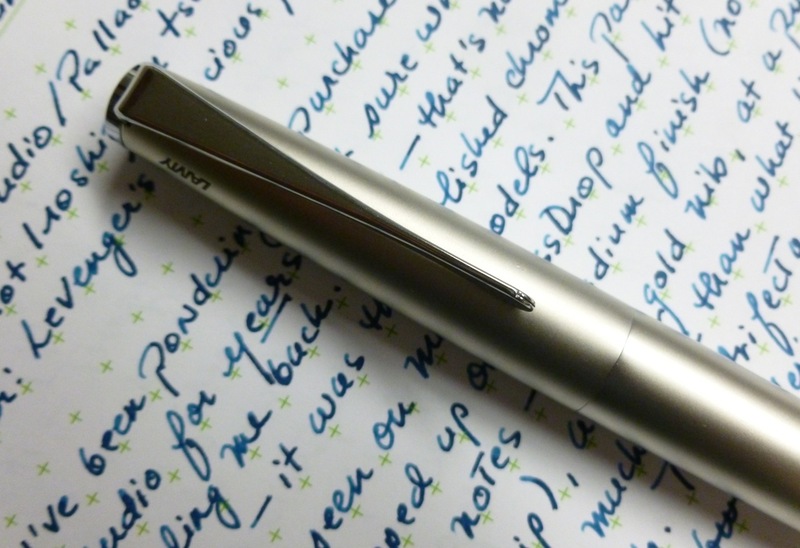 The clip on the Lamy Studio certainly stands out from the crowd. Lamy calls it a “propeller-shaped clip” for the way it resembles…ummm…a propeller, and states that that the way it “turns in on itself is more reminiscent of a modern piece of sculpture than a conventional pen clip.” I see what they’re saying, as it IS sort of sculptural, but I’m a little undecided about the look. I like that it’s unique, but the higher profile makes it seem a little “bulky.” Well…not really bulky…but not as sleek as most clips. It functions perfectly fine for my purposes (clipped into a pen case), so no complaints there. The perpendicular profile might not suit those looking to clip the Studio in a shirt pocket since it doesn’t lay flat. So, yeah, I’m still a little bit on the fence as far as the clip goes. The palladium finish on this model means that the grip isn’t a fingerprint magnet, but it turns out that it’s still a little slippery—both in shape and in smoothness. There’s nothing, structurally, to keep your fingers from sliding down towards the nib, so I do find that I’m having to grip the pen a little more tightly. I’d hoped that the “brushed” palladium finish would add a bit of grip but I don’t think that it does. As a result, I sometimes notice more hand fatigue with this pen than with others. Kind of depends on the day and the temperature and the state of my hands—not an issue one day, then more so another day. The Studio arrived with two Z26 converters, but I’m quite sure that MassDrop threw in a spare. Sweet little bonus. The snap-cap posts well, with a very satisfying “click” when pressed onto the end of the barrel. 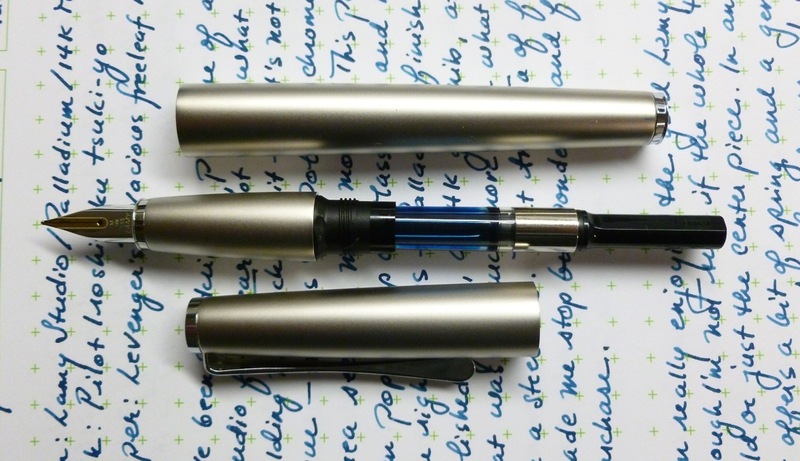 The pen has a nice weight (34 g overall, 24 g body, 10 g cap) and is very well-balanced whether posted or unposted. 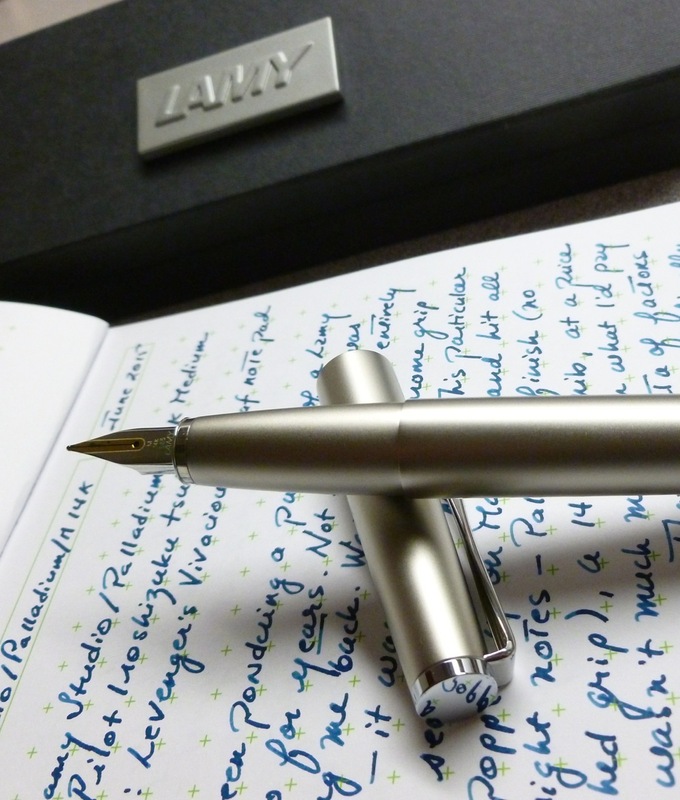 The Lamy Studio is a sharp looking pen—particularly in this champagne-colored finish. 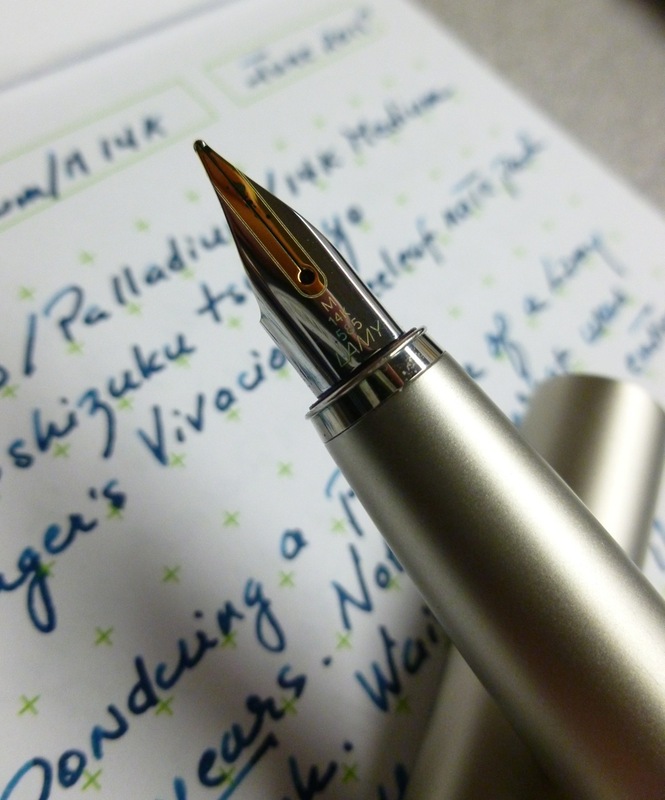 The 14k nib is noticeably springier and more fun than its steel counterpart. It’s a slick pen—with highly polished trim, minimal branding, and a uniquely styled clip. But it’s also slick to handle with a sloping, somewhat slippery grip. Though I sound iffy, I’m glad that I finally added a Lamy Studio to my collection, and think that, for me, the pluses outweigh the minuses. 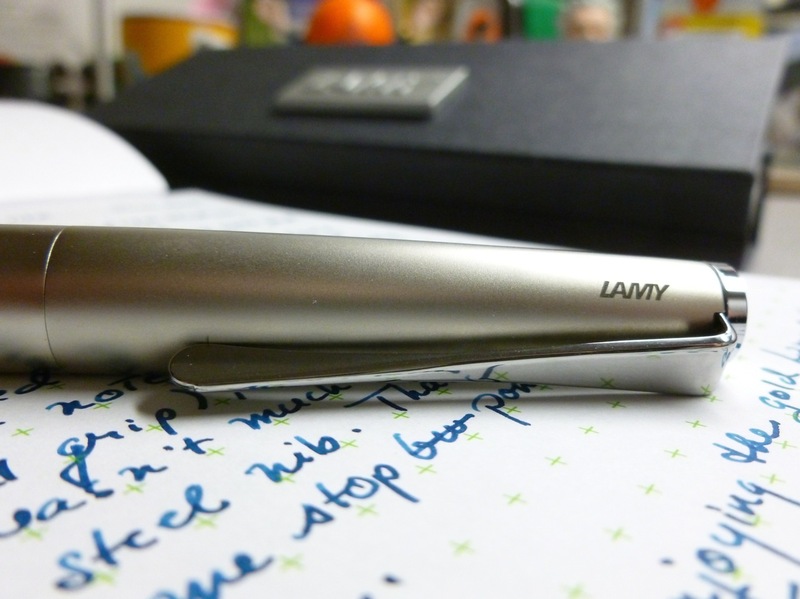 The Lamy Studio—it’s one slick pen. Whether that’s a good or a bad thing is up to you. The pen was inked with Pilot Iroshizuku tsuki-yo. 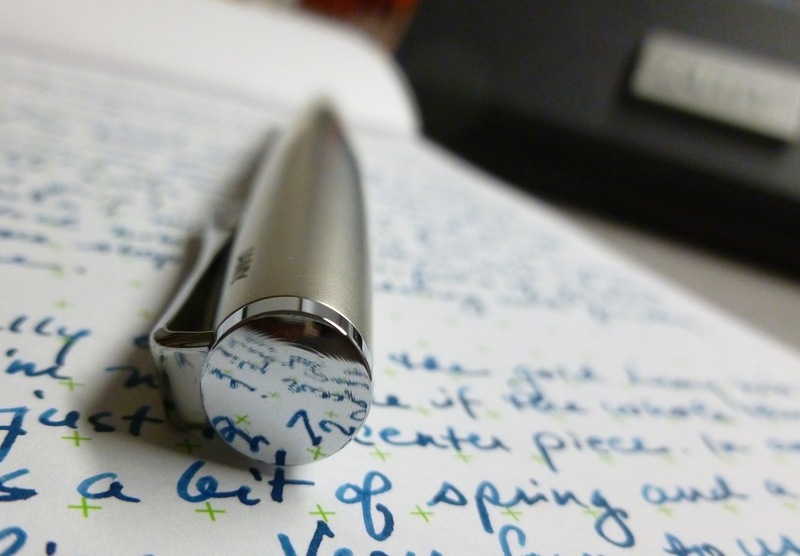 The rough draft of this review was written on Levenger’s Vivacious freeleaf note pad.